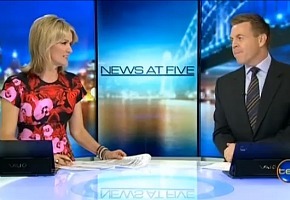 Sandra Sully & Brad McEwan, can it really be over? For years Sandra Sully and Brad McEwan have been sharing the news desk on TEN, including TEN Late News and TEN’s Sydney News. Their chemistry and on-air banter has amused us in late night viewing and even attracted their own YouTube clips. But next month it’s all over as Brad McEwan returns home to TEN News Melbourne, to be replaced by former Rugby Union player, Matt Burke. McEwan’s appointment to Melbourne comes as Stephen Quartermain becomes the permanent replacement to Mal Walden. Burke’s sports career includes representing Australia in three World Cups (1995, 1999, 2003), 81 Test appearances in Wallaby Gold, 115 appearances in the sky blue of the NSW Waratah’s, and in 2004 becoming the overall leading points scorer in the then Super Rugby competition. He recently joined TEN as a Rugby commentator. “Extending my association with TEN, as a rugby commentator to also being part of TEN’s prime time evening news, is an exciting challenge,” he said. TEN CEO, Hamish McLennan, said: “Signing Matt as our Sydney Sports Presenter is a big coup for TEN News. “Matt is a sporting legend, and we are very excited to have him on our team,” he said. Ten is on a roll? Off a cliff maybe. McKinnon is doing the early morning/mid morning news. What? No! What a stupid idea. Oh no! Still haven’t recovered from the cancellation of their Late News which was far superior to the current rubbish. Wish newsrooms would realise just because someone was great on the sporting field doesn’t mean they’re great behind the sports desk. Feel for those in Melbourne. Quartermaine is terrible as an anchor. Steve Quartermain as anchor? Really? Terrible idea. Why couldnt they have given that spot to another sport journo instead of a former Rugby player come commentator. Maybe Scott McKinnon. Bad move TEN. Have to ask…Matt who??? I always make sure I watch Play of the Day just for Brad to throw back to Sandra. The dynamic duo. We get the Melbourne news here in Tassie. Always enjoyed Brad on the late news, so it’s good someone of his quality will be Q’s permanent sports presenter. sandra should be so lucky – matt is a cutie !